Hashtags are a great way to maximise your contents exposure, and they are now becoming more popular on LinkedIn. Here are some tips to ensure that you have a solid hashtag strategy to use on LinkedIn. 1. 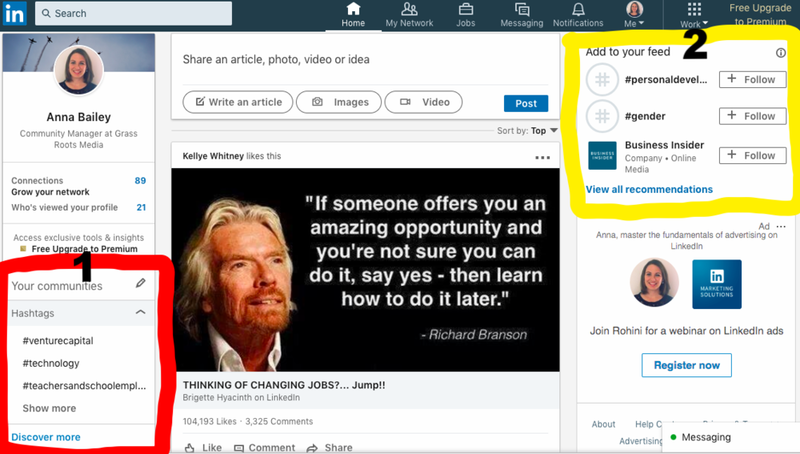 On the left hand side of your LinkedIn home page is ‘Your Communities’ tab. Here you can find and explore that hashtags that you follow. As well as discover new hashtag suggestions to follow. 2. On the right hand side you will find suggestions made by LinkedIn of new and relevant hashtags to follow based on your activity. 3. Before you start incorporating hashtags it is important to determine which are appropriate and relevant. By plugging potential hashtags into the LinkedIn search bar you can chaeck that context that it has been used in the past as well as its popularity. #TopTip: Try Hashtagify.me to vet hashtag popularity, this site allows you to easily search for hashtags or phrases to discover their definition and popularity. To discover what specific hashtags mean to an audience, try Tagdef. A quick search can ensure that your hashtag doesn’t have a hidden message you didn’t know about. Pro Tip: To develop a hashtag strategy, you must first find the hashtags that best connect you with your ideal audience. As you discover relevant hashtags, keep a Google Doc with a list of them in so you can quickly update your ‘Linkedin Hashtags You Follow’ list as needed.